As some of you may know, I studied building design before I got into architecture. Overall it gave me valuable experience, but for my first project let’s just say I started from the bottom, the very bottom. 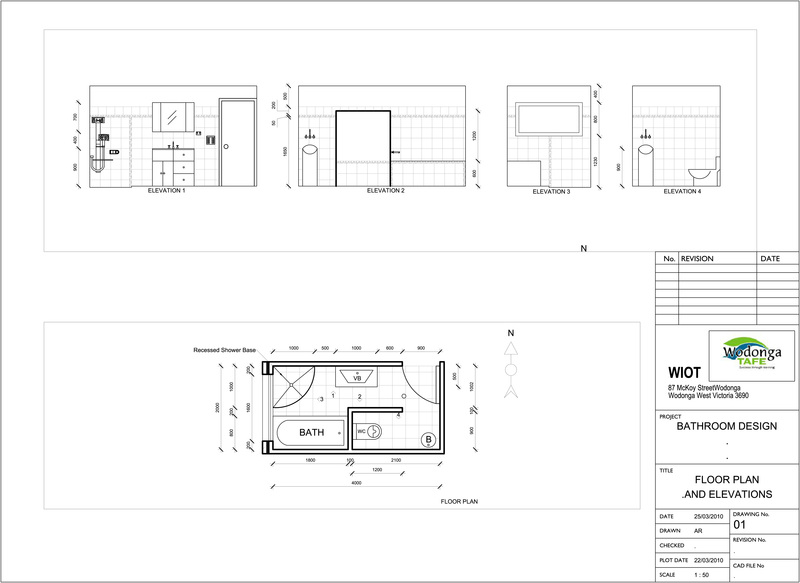 The first project was a bathroom, we had a 4x2m internal space to accommodate a shower, bathtub, vanity and toilet. At a glance, you can tell someone with zero experience designed this bathroom. I was really focused on products, and not the functionality of the space, and you’ll see what I mean…. I managed to find a self-evaluation of the project I wrote on the 7th of May, 2010, but before I share some of that, let me quickly take you through my design. First thing you notice walking in a beautiful free-standing circular basin, tucked behind the wall is the elegant toilet suite. Now make sure to turn sideways as you walk past the vanity unit to the recessed, curved open shower. Ignore all the wet tooth brushes and shavers, that’s just from the morning’s shower. To your left is what appears to be your standard bathtub, but wait until I operate the C-BUS system… Excuse me as I squeeze past you, it’s a very un-functional space…. Now with a click of this button the lights in the bathtub turn on, adjusting the light colour to my mood….. Now we have filled the bathtub with water you can see the full effect of the lights, pretty isn’t it? I’ve yet to taken a bath with the lights on, for safety reasons, but I’m sure I won’t be electrocuted….. I can’t seem find photos of the “model” or “materials board” I made, which is a shame as they were interesting to say the least. From memory, they were both terrible, but the highlights were Vegemite stains on the bathroom walls (I got hungry while making it) and just a flat piece of formcore board to ‘represent the toilet’ as I didn’t know how to build it. Also the materials board was fixed to a piece of plywood with feedback being ‘Try and use something that is featured in the design”. Now, for some self-critiquing, 2010 style. “It appears it is quite obvious I haven’t done any form of schooling prior to this project after I left high school. I believe my main lacking was time management skills, as most of these assessments were completed either the night before, or on the day it was due. I also overall need to just take more care, more thought and more research into the assessments. This is where I really suffered in my marks, and this is where my lack of time management came into effect. I did not do any real research into my design, nor did I write down ideas, show development drawings and the like. Next project I am going to have to buckle down and really research, keep records of ideas, show development drawings, and just really improve on my design work. While on the subject of design work, I need to design better, as my window came down too low which could allow people to see the person showering, and also the spacing between the vanity basin and toilet wall was very little. This came down to research and development drawings, if I had done these, I would have came up with a better design. I initially thought my autocad drawing wasn’t too bad, but I didn’t score as high as I wanted. I believe some minor details like the viewpoints, dimensioning and so forth lowered my score, so when it comes around next time to do autocad drawings, I know what to look out for and make sure I do properly. Another thing is to make sure I do not leave future autocad assessments too late, as I have found doing autocad is no easy task and requires time and concentration, and if it is rushed, it shows up. The materials board, I believe, again, wasn’t too bad, but my marks showed otherwise. I was classed as “Not Yet Competent” and this really brought me down. I need to make sure I take more time with the board, as finesse and tidiness was a major factor in my low mark. I also missed a couple things such as the bath and basins, which I was disappointed with. This assessment I completed the night before, and I could put the blame on the tile place for having my tiles so late, but really it was up to me to follow up on them, and least do other aspects of the board while I was waiting. There you have it, my first project, ever. Looking back I do give myself a face-palm but it goes to show you are always improving, and yes our earlier projects we will look back on and shudder and may even be embarrassed, but these helped shape us and made us who we are today. P.S If anyone wants to help me develop and build my light-up bathtub, flick me an email. We could make millions! i was at a crit last year where there was a student who designed a bathroom in the project and you could actually sit on the toilet and wash your hands at the same time. i suggested to all of the students that if you are unsure of how much room you need, go and measure the distances in your own bathroom, but who knows, maybe his toilet and sink were like that! good first project!